1. Select the table portion whose formatting you want to replicate: single or multiple cells, single or multiple rows, even the whole table. 3. Use the mouse to select the target cell(s), row(s), or table to which you want to apply the source formatting. 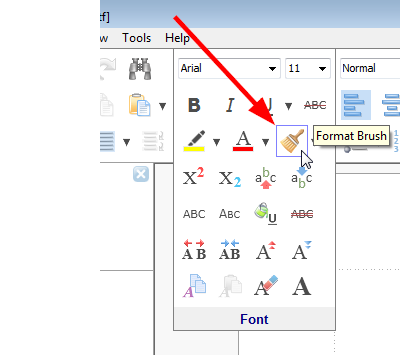 Press the Esc key, or click the "Format Brush" button on the "Font" toolbar again, when you have finished transferring table formatting.